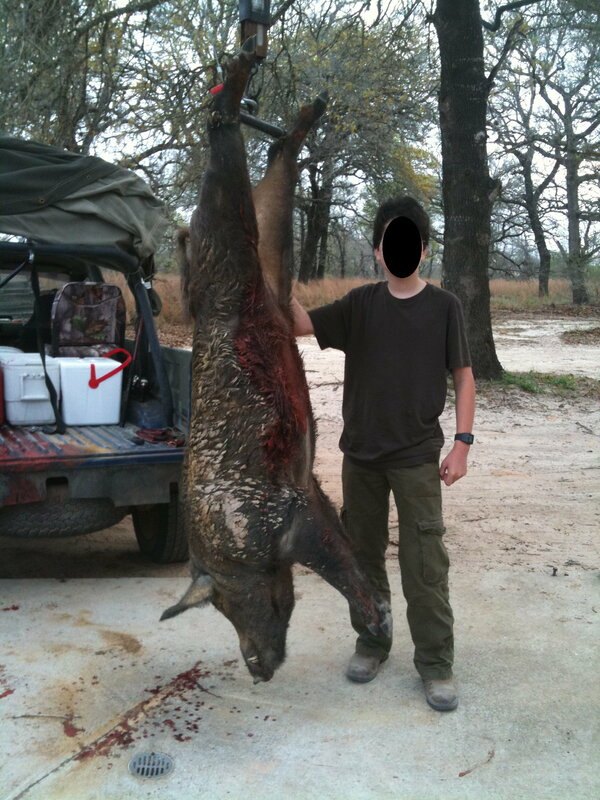 Oldest just passed a milestone — he bagged his first hog; in fact, he bagged his first anything. And it’s a doozy. I’ve been trying, struggling to have a weekend hunt with my long-time friend Charles, of Tactical Gun Review. Something always comes up, usually on my part, and we can’t get together. Charles has a deer lease in the South Central Texas area, but what makes it a great lease is not just the property but that he has year-round access to it. Outside of deer season you can go fishing, dove hunting, turkey hunting, and yes… hog hunting. A few months back we set this weekend on our calendars as a “must do” and it happened. It wasn’t going to be just us tho, we brought our older sons with us as well, who have known each other for just as many years as Charles and I have known each other. We arrived Friday evening but with more than enough daylight to get us into the blind and wait. We parked our cars, pulled out the rifles, climbed into “The Beast” (an old Toyota 4×4 Charles keeps at the property for getting around) and headed for a stock tank on one side of the property where hogs had been seen. Unfortunately the pop-up blind blew into the tank, so we just plopped down on stools under a tree and obscured by tall grass. We waited. Night fell, but with that “super-moon” out you could see a lot going on, it was so bright. We never saw any hogs. Some deer, an owl, lots of other critters. But alas, no hogs. We piled back into The Beast and checked out some other tanks, parking The Beast well away from the area and stalking up on it. It was obvious there was activity, just not when we were around. Ah well. We eventually headed back to the cabin for dinner and hanging out around the campfire drinking beer (boys – root beer, dad’s Dogfish Head brown ale) until the wee hours. After a few hours of sleep we headed back out. Charles put Oldest and I at one of the stock tanks we visited Friday night, while he and his son headed to another area. The sun came up. A turkey was calling and showing and we watched him for a while. Then across the stock tank, probably 100 yards or so away, 2 does. No, 3 does… 4… 5… 6. It was nice to watch all those does grazing, but darn that the season is well-over. 🙂 After maybe 15 minutes or so we noticed the does spooked and took off. Seconds later we see why. We were atop a high bank on one side of the tank. The opposite bank was probably 60 yards away, then up that bank 35 yards or so starts a tree line. Deep within those trees we saw all these little black masses running across the way. Yes yes yes! Hogs! But they were way back in the trees running in a manner that took them directly away from us with no chance of a shot. Oh man! I of course went for my gun too, but I put it down. This was for him. Yes I’d love to get one myself, but this was for him. I was going to be the eyes, the coach. Come on piggy… come on… please don’t run off…. yes! We see the pigs turn and one by one start to run into the area. It’s a stock tank. Water. Plus there was a corn feeder at the far end. Food. A perfect ambush spot: at food and water. A swarm of piglets runs out. I don’t know… 30, 40, 50 of them? A lot. They all headed right for the feeder. Adults follow out of the trees but head down to the water. More big hogs come down to drink. A big one. Drinking. Perfectly broadside. And… holding still. You see, hogs almost never stop, they are almost always in motion so windows of opportunity for a shot can be hard to come by. But drinking? He stopped, he was still. Perfect opportunity. The hog ran for maybe 25 yards, did a circle and dropped. I don’t know if I’ve ever seen Oldest so excited. 🙂 He was wired. Electrified! Once we confirmed he was down, and of course all the other hogs scattered from the sound of the gunshot, we left the blind and headed over to see him. I thought he was maybe 150 lbs? But I’m terrible at such estimates. We snapped copious amounts of pictures. We sent text messages to Wife (and kiddos back home), to Oldest’s grandfather and uncle (Wife’s family, life-long hunters). Much happiness. While waiting for Charles to come get us, another hog came through the trees! I snapped up my rifle and knelt down, got a bead on him and was prepared to take the shot, but a clear shot never presented itself. Either the hog wasn’t positioned well or there were trees/brush in the way. Eventually the hog got close enough, noticed us, and took off running. A second hog would have been nice, but no matter. Heaving this big boy into the truck was a chore, even with a winch. But we got him back to the cabin, hoisted him up and weighed him. We gutted him (I got more practice at cleaning an animal) and while looking at the organs I saw the heart. The bullet had fully penetrated the heart. Right through the shoulder — and the massively thick “shield” (and his was a formidable one), right through the heart, and complete passthrough. Based upon how the entry and exit wounds looked, it looks like that Barnes Bullet functioned as advertised. This is why I love Barnes Bullets. For the record, it was a Federal Premium P308H Vital Shok (165 grain Barnes TSX). I figure he was shot at about 60 yards, so he got hit with that 165 grain bullet going about 2500 fps and probably hit with 2300 ft/lbs or so of energy, with that Barnes Bullet expanding and dumping almost all of that energy inside the body. After we dressed the hog, we put him in a walk-in cooler because we were tired and not in the mood to clean him fully. Went fishing, and Oldest caught a nice bass. Best I did was get some nibbles and got one on but he jumped and threw the hook. Charles landed a nice one, and his son did too. But fishing didn’t last long as it was getting hot and we were all tired and hungry. Back to the cabin, eat, nap. We went back out that evening but we didn’t see anything. Charles and his son did have an opportunity, but the hog ran off and they were unable to connect on the running shot (it’s not easy). Oh and Charles’ son had a bummer earlier. While we were cleaning the hog, Charles’ son was still out in the field. Hogs came by, he stalked up, knelt and took aim and… click. The round didn’t go off. Bad primer? hard primer? who knows, but no bang. He was quick enough to work the bolt and chamber a new round, but alas by then the hogs were off. Bummer that he didn’t get the shot off, but he did everything right from staying in the field to stalking to remedying the malfunction. I say that’s well-worthy of praise! Had to get home early on Sunday so we left before sunrise, leaving Charles and his son sleeping in the cabin. Bummer we had to go so soon, but we were both tired and drained and ready for a shower. 😉 Charles has the bigger cooler and will drop the meat off on his way home. I’ll take it to the butcher in a few days and we’ll have lots of sausage in the freezer. Oh sure, if I bagged one that’d be nice… but this was so much better. It’s great to see my Son so excited, so ready, so happy. But also, so disciplined. He took instruction from me so well, from studying anatomy charts, to listening to me talking about visualizing success, imagining the hog there, calming yourself, finding the target (“Aim small, miss small, right Dad?”), don’t take too long but also don’t rush it, smooth trigger press. He did everything right, and it paid off. What all did he take from this? I don’t know. He doesn’t really know either, other than the immediate payoff of the joy of the accomplishment along with lots of meat. As his uncle congratulated him, “You put dinner, lunch, and breakfast on the table!”. I’m thinking more about the long-term. Will there be something in his life that will be able to be traced back to this weekend, to that moment? We’ll just have to wait and see. Meantime, I have guns to clean. It’s all sandy out there and there’s grit and sand in everything. You work the bolt on that rifle and it just grinds and makes me cringe. I can’t expand/collapse the stock on my 6.8 without it sounding like sandpaper. I think that was the only bummer of the weekend was all the sand and dust everywhere. I must give big thanx to Charles. His support and generosity made this all possible. Thank you, my friend. Y’all go visit and support his site, Tactical Gun Review. Son, you did good. I’m proud of you. Man. What a hog. What a kill. Couldn’t have been better. Awesome! Thanx! It was a good weekend. Damn… that is quite the pig! Congratulations all around.